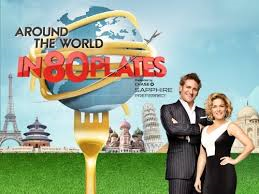 Around the World in 80 Plates (Bravo) Rated NR | What to Watch. While I did enjoy watching the chefs as they traveled to different countries, cooking up the local cuisine, it really felt just like every other reality show already out there. Curtis Stone, as the host, was the one highlight of the show. If only it had lasted longer than one season, I might have recommended it, but with its unoriginal format and subsequent cancellation, I guess it’s really not worth a watch. This entry was posted in 2012, Bravo, Rated NR, reality tv, reviews, Tv shows and tagged Around the World in 80 Plates, Avery Pursell, bravo, Cat Cora, challenges, chefs, contestant, country, cuisine, Curtis Stone, different, host, local, not worth, one, reality, reality series, reality show, reality tv show, season, show, survivor, The amazing Race, top chef, trailer, traveling, tv, TV series, Tv shows, world. Bookmark the permalink. Pingback: Summer TV Shows 2012 | What to Watch.